First of all, thank you so much for considering sponsoring a child through Bridging Villages. We are committed to doing everything possible for you to feel connected to your child, and keep you updated on any exciting milestones that occur in their lives. All photos and child’s personal information should be protected and not displayed on the internet in any form, including any social media sites, email, personal blogs or websites, etc. Any packages/gifts sent to your child will take approximately two-three months to reach Uganda so plan accordingly. Sponsor parents are responsible for all costs associated with shipping packages. Birth dates are often not known so sending packages at any point in the month of their birth will be very exciting for the child to receive. Official sponsorship of a child will end at the completion of Senior 6 however if the sponsor parent wishes to continue donating the monthly charge of $40 it will be put toward their university/trades tuition fees. If after a child has completed Senior 6 the sponsor parent would prefer to begin sponsoring a new child that is also appreciated and absolutely OK. There is also the option to discontinue all sponsorships at this point (or any other point). You will be contacted by a member of Bridging Villages to inquire about your preference when this time comes. Due to payment schedule in Uganda for school tuition fees we ask that should you decide to sponsor a child, you commit to a minimum of one year (480 CAD) sponsorship so as to ensure that your child is able to complete the current grade they are enrolled in. We would love to make it easier for you to stay in contact with your child by sending videos and pictures to you as well as providing a way for you to send letters and pictures/videos to them. For this reason we would love for you to go to www.getassist.com and register an account. We will send you an invitation via email once you have officially become a sponsor parent inviting you to our Bridging Villages community. This site has incredibly high security parameters and as such allows for the most secure means of sending videos and pictures back and forth to your child (far more secure than email). We will also send you an email to invite you to our "community" on getassist which will make it easier for us to connect with you directly and keep you updated on your child as well as for you to send letters as often as you like. 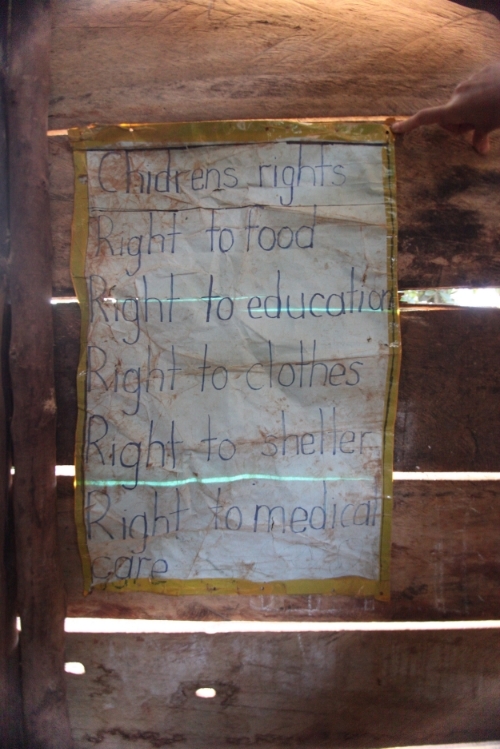 This poster hangs in the Primary 2 class at Mugalula Community School reminding the students of their basic rights as people in this world.